At UKDN Waterflow (LG), we provide a complete drainage service to residential customers throughout the UK. From a 24-hour emergency service for blocked household drains to conducting CCTV surveys, sewer cleaning, drain repairs and no-dig renovations, we have resources and technology at a depot near your home. Our domestic customers are just as important to us as commercial clients. That is why no drainage job is too small — or too big — for the UKDN Waterflow (LG) team. We are the experts at unblocking pipes. A blocked toilet, sink or drain causes bad odours, flooding, and even rodent infestations, so we understand that you need it fixing — and fast. Just call our contact centre, day or night, on 0333 344 2937 or complete the contact form at the side of the page. Obviously, the longer a leak goes on, the more damage it is likely to cause to your property and belongings. You may be insured, but a financial claim is unlikely to compensate you for the worry, stress and upset you and your family suffer — and some things simply cannot be replaced, especially items with sentimental value. To minimise the devastation and disruption, we aim to be at your premises without delay. We will find the blockage, identify the problem, and deal with it accordingly: dislodging a blockage using high pressure water jets, or with a temporary solution ahead of more complex repairs. Either way, we will not leave until you have a functioning drainage system. Whatever your domestic drainage problem, we offer a full range of solutions and will carry out work at times to suit you. Our engineers will always give you costs before starting work, though as a guide, blockage clearances start at just £70+VAT. We make sure that you know what is happening every step of the way. If remedial work is necessary for a longer term solution, our engineers will explain what, why and how in a written report. If your issue is likely to be the responsibility of your Water and Sewerage Company (WaSC), or covered by your household insurance, we will tell you that too. Thanks to our expert knowledge and specialist camera equipment, we can identify the trouble quickly, but what causes them? Some blockages are avoidable, others less so. 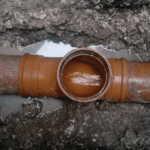 Structural damage, such as tree root ingress or partial pipe collapse, may result in reduced flow through the pipes or wastewater leaking into surrounding land. A total collapse can bring your whole system to a halt. Silt and debris build-up over time can block drains, causing sewage to back up, though is usually relatively easily dealt with. If a sewerage system is not working properly because of a blockage or damage, surges of water during wet weather will increase your risk of flooding. Despite public education efforts by the wastewater industry, householders are still flushing fat, oil and grease (FOG), wipes, nappies and sanitary products down the drains. And that practically guarantees blocked drains. Whatever your domestic drainage problem or emergency, simply call your UKDN Waterflow (LG) team on 0333 344 2937. We are here 24-hours a day, 365-days a year for you.